The Gallery Borghese and the Park Villa Borghese in Rome. Villa Borghese is the most famous park in Rome. It is a beautiful and large green area with many sights and also very popular among tourists. The Borghese Gallery is one of the most important art museums in Italy. Around the year 1600 the very rich Borghese family bought a huge plot of land in Rome and laid out a park landscape. Several buildings were also erected, the largest being the „Casino nobile“, which has housed an art collection since the 17th century. It was one of the largest private art collections in the world. In 1901 the Italian state bought the villa with the art museum. Today the Galleria Borghese Museum is open to the public and is one of the most important museums of art in Rome and throughout Italy. About half a million people visit the Galleria Borghese every year. This high number causes problems. Not so many people fit into the exhibition rooms. Therefore you can only visit the Borghese Museum with a reservation in advance. The number of visitors is limited, often the exhibition is sold out for a longer period (days or even weeks). On this page you can find the tickets for the art gallery on the internet. 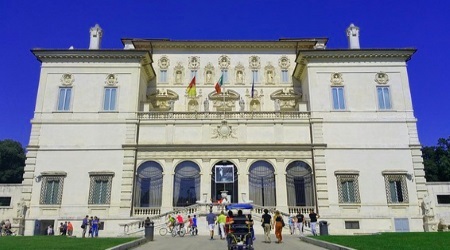 The Museum Galerie Borghese is one of the largest art museums in the world. Every visitor of Rome who is interested in art should definitely visit the collection in the park Villa Borghese in the centre of Rome. You will see works by such world famous artists as Raffaelo, Rubens, Tiziano, Cranach, Giorigione, Corregio and Bernini – to name but a few. Absolutely worth seeing. Tickets in advance only! As is often the case in art museums, the pictures only become really interesting when an expert or guide explains the works of art. Therefore, it makes sense from our point of view to book a good guided tour through Galleria Borghese. There is a very good offer for an extended tour with excellent guides in English (duration about 3 hours). Admission tickets for the corresponding date are of course included. Also the zoo of Rome „Bioparco di Roma“ is located in the park Villa Borghese. The zoo is over 100 years old and was designed by Carl Hagenbeck, the founder of the famous zoo of Hamburg. Today more than 200 animal species live in the Biopark Rome. Unfortunately, the area of the zoo is somewhat small. Some critics think that some larger animal species do not have enough space. But the Zoo of Rome made a good impression on us. 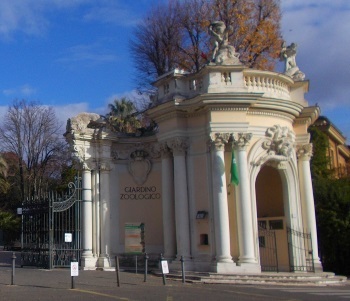 The entrance to the zoo is, like much of the Park Villa Borghese, architecturally worth seeing. Opening hours Rome Zoo 2019: The zoo is open in winter from 9:30 to 17:00, in summer from 9:30 to 18:00. As far as we know there is no closed day. National Gallery of Modern Italian Art (Galleria Nazionale d’Arte Modern): A top museum, large, over 70 rooms and about 5000 (!) works of art from the 19th and 20th centuries. After the gallery Borghese the second big museum in the city park Villa Borghese. Opening hours: 8:30 to 19:30 (except Monday). Admission 10 Euro for adults. With discount the entrance fee to the National-Gallery in Rome for Modern Art is 5 Euro. Museum Pietro Canonica: Worthwhile because there is no entrance fee. Pietro Canonica was a famous sculptor (1869 to 1859). He lived in the house in the middle of the park where his museum is today. Quite large exhibition. You should definitely take a long walk in the green area of Villa Borghese. You can watch the Romans playing football or having a picnic. At a small lake (see picture) you can rent boats. 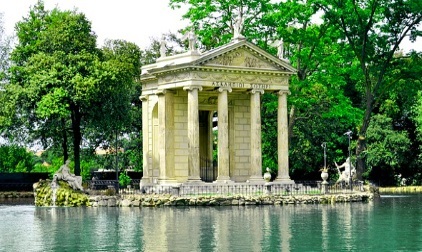 On a peninsula in the lake is a small temple called „Tempio di Esculapio“. Those who come via the subway station Fiaminio via the Piazza del Popolo to the park Villa Borghese (our recommendation) should definitely look back after the stairs up to the park. You have a great view to the square and parts of Rome. There is a viewing platform called Terrazza del Pincio. There is also a famous cinema (Casa del Cinema) in the city park of the capital of Italy. Mostly very good films, the house is also worth a visit because of the architecture. 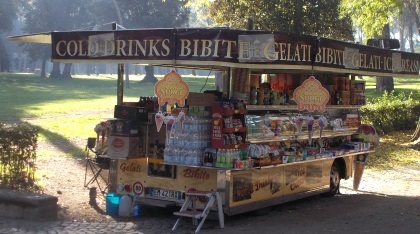 Several restaurants, cafes and snack carts (see picture below) serve food and drinks..
For people with little time we recommend a walk through the park and a visit to the art museum Galleria Borghese, tickets you have to buy in advance. If you have more time, you can also go to the zoo and visit the other museums, all of which were previously the National Gallery of Modern Art of Italy. Unfortunately, there are several bigger streets through the park, which disturb the idyll very much. Many Italians even come to Villa Borghese by car, there are even larger parking spaces. Many Romans also come by taxi. We recommend the journey with the underground (line A). The best stops are Flaminio at Piazza del Popolo and Spagna, right in the centre of Rome. From both stations you have to walk up a hill to the park. But it is not far. The marker on the map shows the location of the gallery. Near the subway station Flaminio there is a bus stop with buses in the park Villa Borghese (frequent arrivals as there are several lines). You go one stop and get off (Canestre stop, roundabout). You can also walk up „Viale Giorgio Washington“ (about 10 minutes uphill). 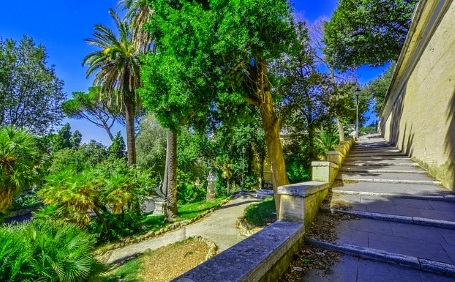 Many visitors also walk behind Piazza del Popolo, a large, famous square about 100 meters from the Flaminio metro stop, up the stairs to the park. More art in Rome: Another grandiose art museum in Rome is the gallery of the Vatican.